I have been so excited to tell you about this that I can barely stand it. I promised you something big and something pink. Here it is! Lauren Willig’s Pink Carnation series will be coming to a close when the twelfth book is published in August of 2015. The Pink books have been a great ride, and I have gobbled them up like candy every time a new one was published. The challenge for readers of a series that has climbed to twelve books? Keeping twelve books’ worth of characters and events straight in your head. Lauren is a whiz at bringing back characters we haven’t seen for a few books and giving them new jobs to do. When I read the tenth book last August, Lauren tossed in a few references that I knew I recognized, but I couldn’t remember quite why. Next year, when Pink XII is released, I want to be up to date with what’s going on. I need to go back and reread the whole series to get ready. The best part of it all? Several of my fellow Pink Enthusiasts are coming with me, and we want you to get involved too! Miss Eliza of Strange and Random Happenstance (who designed the beautiful banner and is generally amusing and awesome), Erin, and Beth have all signed on to pick their favorite Pink book and lead a month of fabulous reading. We’ll talk about read-alikes, characters, history, popular conventions, deleted scenes, casting in our “if-only” movie adaptation scenarios, and plenty more. Did I say the best part? Perhaps I spoke to soon. If you are a regular here, or know me at all, you will know that my affection for Lauren rivals that of Leslie Knope for Ann Perkins . Because Lauren is incredibly gracious and kind, when I approached her about hosting this year-long reread, she agreed to autograph a copy of each of her books for me to give away here on the blog. To sum up: One year of Pink reading. One book per month. Guest bloggers to guide us through. Prizes. General frivolity. This is going to be an amazing year. That leaves seven Pink books for you to choose from, if you are so inclined! 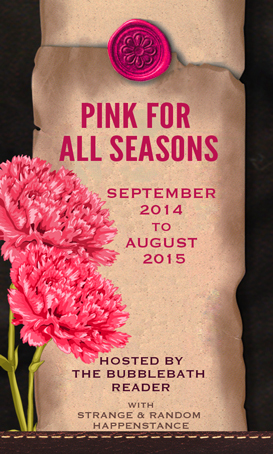 Send me an email at ashley.pinkforallseasons@gmail.com, and we can talk about how you can participate. If you haven’t read the Pink books, this will really be the perfect time to give them a try. I mean, it’s not just me who thinks they are awesome. Lauren’s books have been Romantic Times Top Picks and RT Readers’ and Reviewers’ Choice nominees and winners. Her books have won a RITA, a Booksellers Award, a Golden Leaf Award, and regularly appear on the NYT Best Sellers lists. September is right around the corner, but you have plenty of time to get yourself a copy of The Secret History of the Pink Carnation and get excited. This is going to be awesome. Greetings from the fellowship of the unashamed. (men who love chiklit) I have never taken a bubble bath in my life (well maybe as a kid) and your website title sounds formidable for a manly lover of Lauren Willig’s work. However I plunge ahead and declare this to be a great idea indeed! I plan to crash the party and participate nevertheless. I am so excited. This is a brilliant beyond brilliant idea. I’d be happy to help out if you still need bloggers or whatnot! Thanks, Dara! If you have a favorite Pink book you’d like to moderate, shoot me an email (ashley.pinkforallseasons@gmail.com) and we’ll talk details! Reblogged this on The Pink Book of Goodness. How fun!! I just started rereading the series, so know I think I’ll finish Emerald Ring and then join everyone else in December. Sounds great, Missy! You’re in for a treat with these books. Feel free to visit in the next few months as we talk about the first three books as well. So fun! I love the Pink Carnation series. I’ll be sending you an email! Great, Alsion! I’m glad you’re excited to re-read with us. How fun!! I have been thinking I need to reread them all before the last one comes out and I love the idea of having fellow pink fans to read and discuss them with. I’m in!!! Also I am very glad I have found your blog. After reading through several of your older posts I have determined that I have found a kindred spirit. From childhood favorites to books that I like (and don’t like) now, our tastes are very much alike! Thanks to you my TBR list on Goodreads just got a lot longer!!! I haven’t read any yet, but a good friend was telling me about this series, and I love historical fiction, soooooooo, now is a great time to get started! One a month-I can do that! Brenda, you are in for a treat! I’m glad you’re going to read along with us. Morgan, I’m glad you’ll be reading with us! I finished the 11th book a few days ago, and it was great. I can’t wait to get back to the beginning. I found your blog thanks to Lauren Willig’s facebook page. I have read all of her books and I love them. I am super excited to re-read them with you. Looking forward to all the fun! Thanks, Jennrenee! You are in good company as a Lauren fan 🙂 I’m glad you’re coming along for the ride this year. Would love to join in on the fun. Will send you an email about participating ! This is such a fabulous idea, I have read them all. Each one was my favorite as I was reading. Welcome, Sharlene! It’s going to be a great year. I have read them all very quickly as them came out and then re-read them again, I have been addicted since the first book, I have the first 5 in several formats (HB, Soft and CD) and have listened and read all but the last 2 over and over (they and the first 2 are out on loan). I love them all and eagerly await the next one every time (though I am very disappointed that the last few were not issued in hardcover). I don’t know what I will do when the last one comes out. The non pink books are not as much of an addiction as the Pink books though I have read Ashford twice. Debra, have you read her novellas too? They are all available on her website, and even though they are very short, it’s fun to catch up with our favorite characters! yep, I actually bought printed versions 2 of the novellas, Bunny & Biscuits wasn’t printed for sale or I would have bought it too. Great minds think alike! I had planned to listen to the Pinks in audio once a month to gear up for the last book. I’ve read all the Pinks numerous times, but have never listened to the audiobooks which are read by Kate Reading. I am so excited for Jane’s story and it will be fun to be a part of the read-a-long with fellow readers. Books in the bath has saved my sanity many times. One winter in Seattle I had no heat so I lived in the bath! Mel, you are brave to live in Seattle with no heat! You make a good point, though. I should definitely give the audio versions of these books a try. I’m glad you’re coming along for the ride with us this year! I’m excited for Jane’s story too – did you read the excerpt at the end of Manzanilla? Seattle isn’t so bad as some places in the winter, even with no heat (I had a winter in Seattle with no heat once but it was long before the 1st pink book. I was born in Seattle, I still work there but now I live in the Everett area. I love Kate Reading’s treatment of the stories. She is tremendous on everything that I have heard her read. Welcome, cammmiam! We’re glad you’re here to read with us. I came to Lauren Willig’s books — and really the romance genre as a whole — through The Ashford Affair this summer, and have only just finished Pink Carnation… Very much looking forward to this project and reading the rest of them! Welcome, Hannah! I think you will enjoy the series. You’ll be in good company! Ashley did you get my email? I did! I thought I emailed you back- let me check my drafts and make sure it sent. I’m glad you’re excited! We’ll be starting here on the site tomorrow.